Another day... actually a night and a day. Soto and Alexis were out on the trail much of the night, finding trail for the day and putting markers back up. And then out again at dawn putting it all together. Today was an 'uh oh we can't use the Jerez trail we need to find another one fast' day. And it was actually beautiful today - similar to yesterday's finish through the preserve, pines and sandy trail, wild flowers and prickly pear. Much of it went beside a paved access road so we were able to follow along. Although it was cloudy most of the day and I don't think the photos came out very well - maybe a few! It was actually a lot of fun with Ines - she had a few 'duties' during the day, but also a lot of flexibility about stopping at good spots for photos. 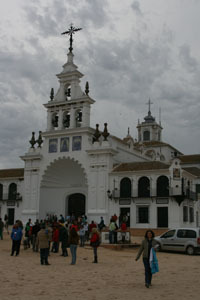 We left El Rocio with the riders, departing from in front of the church - the Virgin Saint Church (or something like that) - a very beautiful and dramatic backdrop for the start. 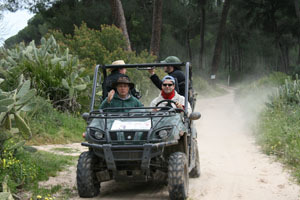 The trail followed a sandy road into the preserve, and went along the forest, across a large flat, and to the vetcheck. 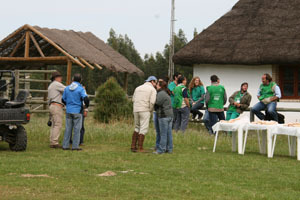 The vetcheck was at some sort of stable near the park. I think it had seen better days though. There were some nice newish structures, quincho's, an old stone building that was a bistro or restaurant or something... but pretty empty at present. A rest for the horses and then back on the trail. We followed the first few horses for a while, stopping for photos when possible. When we got to the road crossing Ines took over traffic duty and we stayed until the last riders came through. It was a gorgeous spot - deep woods, wild flowers, peaceful and quiet. A nice spot to be stuck at. 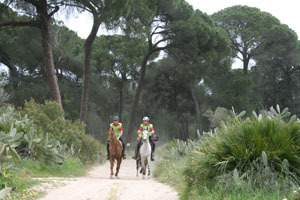 Paco and Arenal are still in - going at a conservative pace (today was too fast for an 8 day, 600km ride I think!!). Eric is still twiddling with the new Polar system - getting the electrode contact worked out, the gps tracking is going well. Spirits are still high - it was an easy day today (relatively) on management. The same location, didn't have to pack up and move to another hotel. Other than having to mark, and remark trail and set up a new vetgate ... that's still plent of work, but tomorrow will be much more! 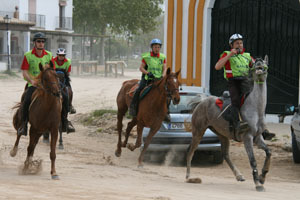 Tomorrow we go to Sanlucar de Barrameda - a ride to another preserve, drop down to the Atlantic Ocean. The rest of the day is riding along the beach, with a vetgate on the beach - and then finish at the mouth of the Guadalquivir River - where it empties into the Atlantic. At that point the horses will be loaded onto an open ferry - and transported to the other side. Quite the production!! And now it's late, the reception desk is closing, I'm going to join Fernando and Paco and Esther (Paco's wife) and Eric, and who ever else joins us, for a late (normal for Spain) dinner and a bit of vino. Then up VERY EARLY. 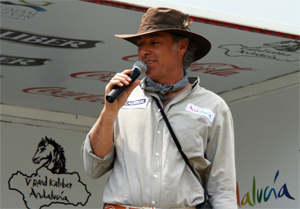 The riders will leave at 7am, I will go on the ATV/Rhino with Antonio and we'll leave at 6:40. Ack! !